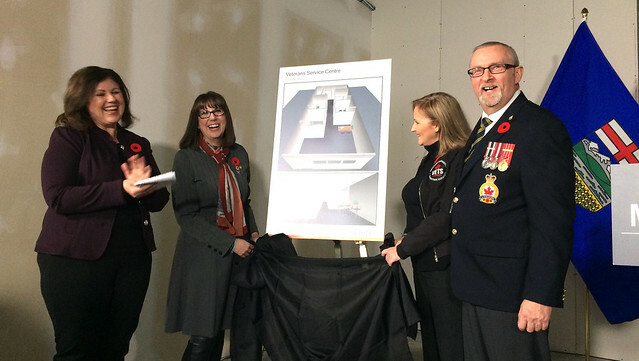 MLA Goehring (second from left) unveils plans for a new veterans service centre with Shawna Laychuck (L), veteran service team manager for Veterans Affairs, Debbie Lowther and Gerry Finlay, command service officer for the Royal Canadian Legion, Alberta-NWT Command. The provincial government is investing $3 million in a new Veterans Service Centre and transitional housing project in north Edmonton. The project will help link veterans to a range of services, including transitional housing, employment and training services and crisis supports. Veterans Emergency Transition Services (VETS) Canada, a non-profit organization, will manage the operations of the Veterans Service Centre. They will also lead the intake process for veterans in need of housing. The service centre is located along public transportation routes with access to the downtown core, the operational stress injury clinic and the Edmonton Garrison. It is just steps away from an apartment building, purchased by the Government of Alberta, to provide transitional housing for 15 homeless veterans. The Royal Canadian Legion, Alberta-NWT Command, is contributing up to $75,000 to furnish the suites in the building. The service centre is expected to be operational before the end of the year. Veterans are expected to begin moving into the transitional housing in the coming months.